Fun at work, can it be done? « Where Does Your Paycheck Come From? While in D.C. a couple of weeks ago an interesting event happened at the Marriott Hotel that we were holding the conference I was attending. The attendees were all in a lecture hall and toward the end of the afternoon we started hearing music outside on the landing. As the lecture session was adjourned and we headed out of the room where we were surprised to see about fifty people dancing the same steps to music. I just stood there and watched as they were having fun and being coached by a choreographer. The participants were certainly having a great time, laughing and teasing each other as they were trying to learn the steps. I wondered what it was all about. The next day after the lecture session I was down in the lobby, it was about 5 o’clock. I saw a large group of employees (I could tell they were employees by their uniforms) heading toward the center of the lobby where a large tower had been placed. At once they stopped, the music began and they all started dancing. It was the same dance we saw them practicing the day before. It then dawned on me that this was the changing of the guard. One shift was ending and the new shift was coming on for the evening. It was a wonderful event for the guests to witness as the employees were dancing, laughing and ready to begin work with smiles and a pumped up attitude. The employees that were leaving their post where clapping and dancing right along with them. It was a wonderful way to change shifts. All employees involved where having a great time and so were the guests as they watched and swayed to the beat of the music. 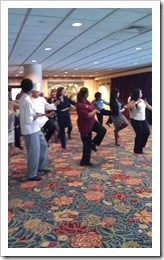 It made me feel good that Marriott was willing to try different ideas to excite employees and make their work fun. All too often employees will drag themselves into the workplace with no fun to look forward to at all. Humor is good in the workplace. According to a study by Dr. Lee Berk of Loma Linda School of Public Heath, in California, laughing effects the immune system making it grow stronger with increased activity of T-cells, natural killer cells and antibodies. Research has also shown that laughing reduces stress, high blood pressure, and oxygenates our blood, which increases energy and relaxes our muscles. Now who doesn’t need that, and with reduced stress we can all enjoy our work better. Oh and didn’t the study also show that laughing increased energy? How many times do we feel sluggish at the office? I invite you to a challenge, do something fun this week at work, cause laughter (appropriately though) and enjoy your colleagues during the day with some levity in the workplace. I would love to hear what you come up with, have fun… I know my staff and I will! This entry was posted on Friday, January 16th, 2015 at 8:00 am by Tina Del Buono, PMAC. Filed under Business Improvement, Employee Management, Happiness, Health Benefits, Leadership, Motivational. You can follow any responses to this entry through the RSS 2.0 feed. Both comments and pings are currently closed.